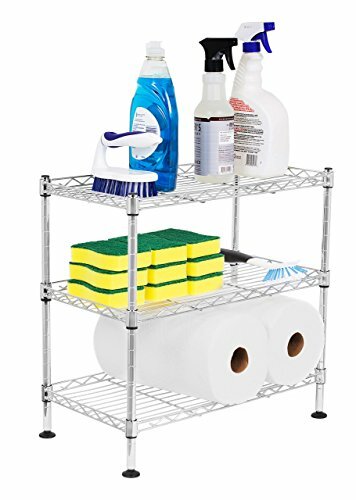 The Internet's Best 3-Tier Mini Wire Utility Shelving Unit is great for adding extra storage and organizing your home! The small and slim design is perfect for adding extra storage space underneath your kitchen or bathroom sink. Great for storing cleaning supplies and scrubbing brushes. The unit could also be used in for adding storage in your kitchen cabinets or in your food pantry. You can easily store plates, bowls, cups, or coffee mugs. The kitchen shelf is constructed from chrome with the ability to withhold 100 lbs. The cart is rust, scratch, and dent resistant, this will look good for decades to come. If you have any questions about this product by Internet's Best, contact us by completing and submitting the form below. If you are looking for a specif part number, please include it with your message.